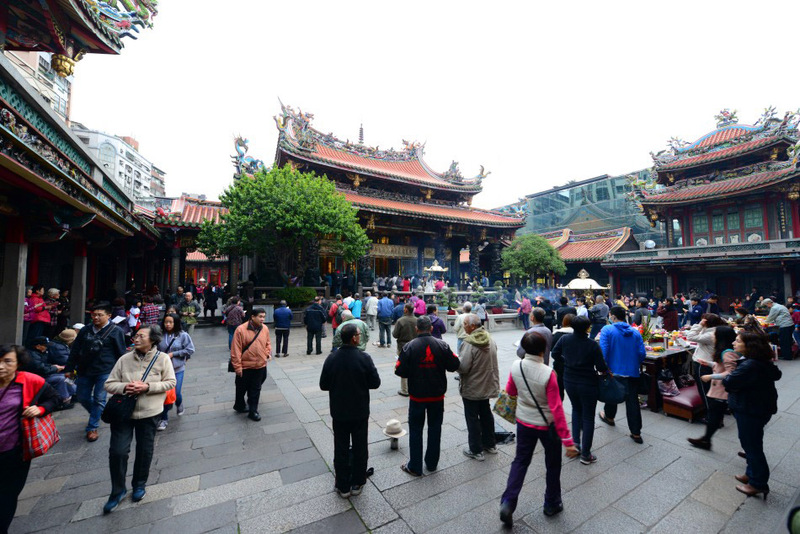 Longshan Temple is a prime tourist attraction and a religious centre in Taipei. 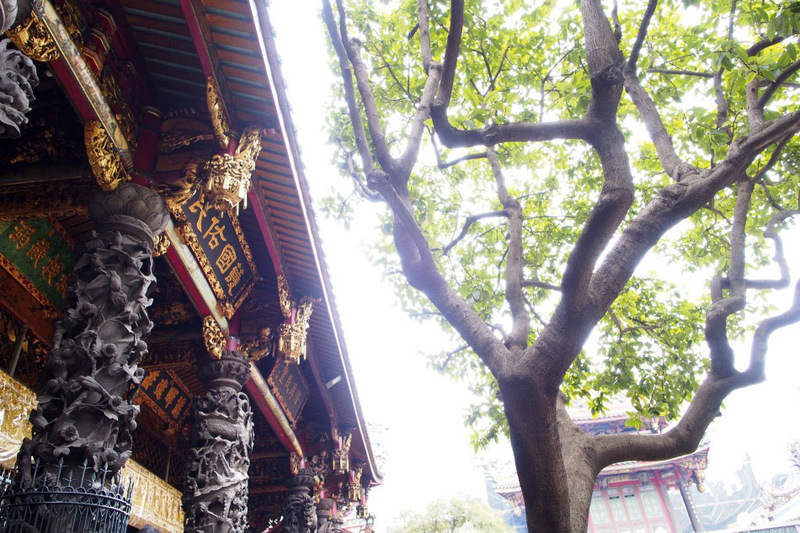 Built in 1738, the temple has survived through earthquakes and fire, and has undergone numerous renovations and reconstructions. 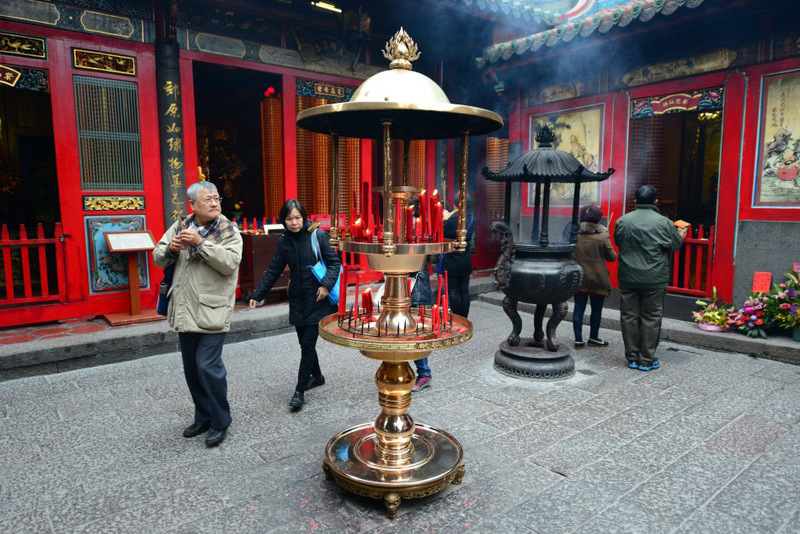 The temple is dedicated to a number of Buddhist, Taoist and traditional Chinese deities. 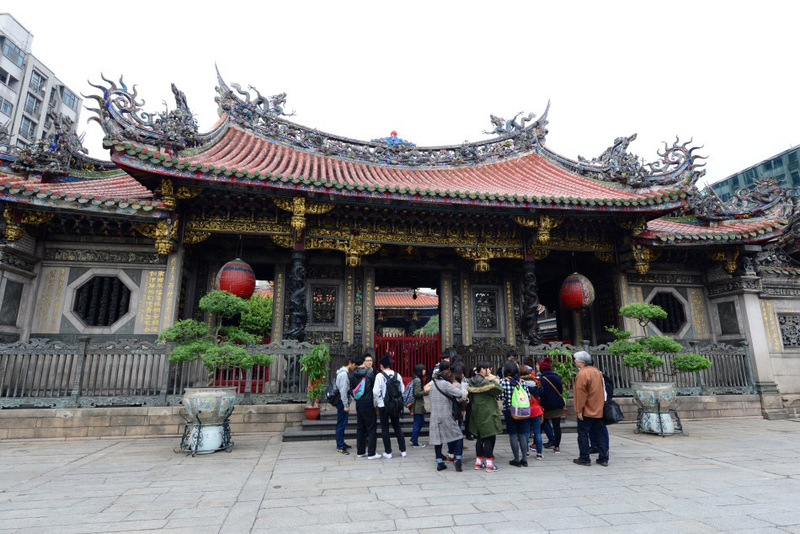 Tourist groups gathered at the Entrance Hall of the temple. 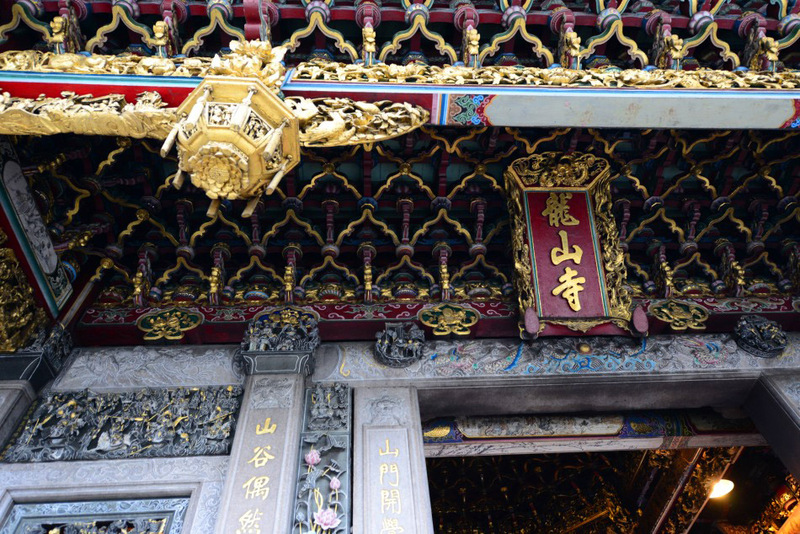 Temple signage and the richly decorated dougong (wooden brackets) under the eaves of the Entrance Hall. 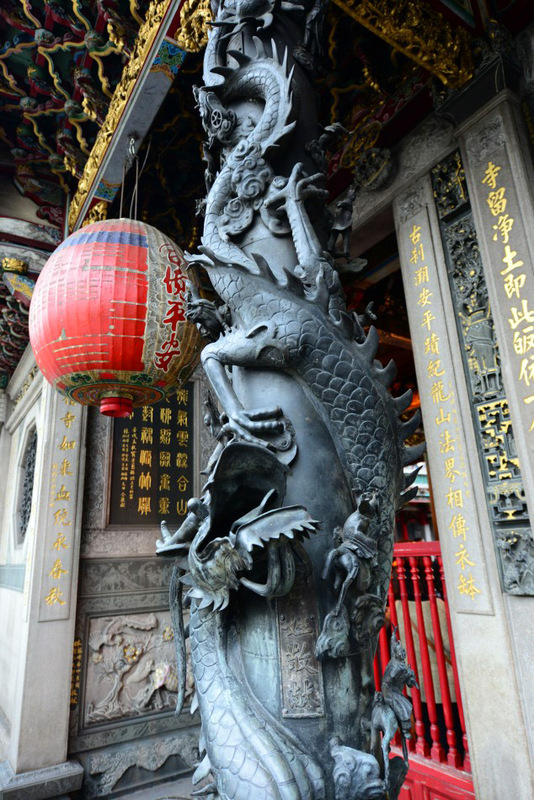 Exquisite carvings, especially the bronze dragons on the columns, are some of the most remarkable details of the Entrance Hall building. 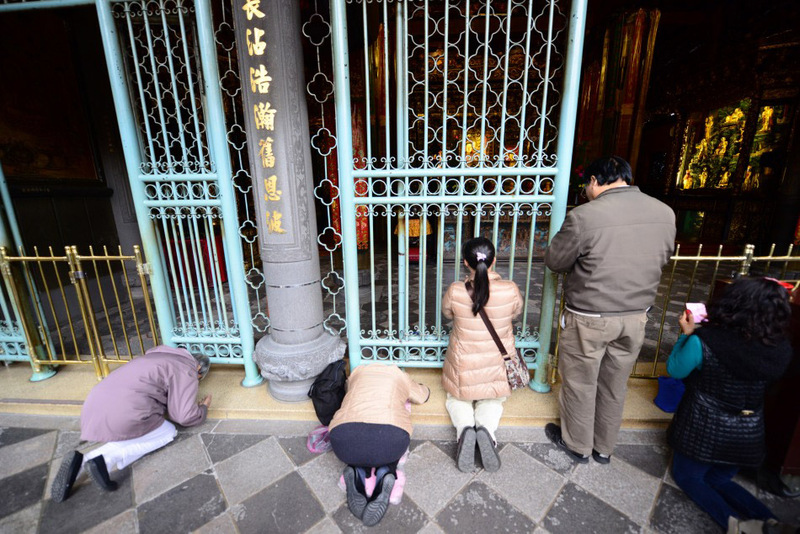 A dozen or so worshipers were busy throwing moon shaped wooden pieces onto the ground, performing a kind of psychic ritual asking for spiritual advices from the gods. Beautiful ceiling finish of the Entrance Hall. Worshipers at the entrance of the Main Hall. Interior of the Main Hall. 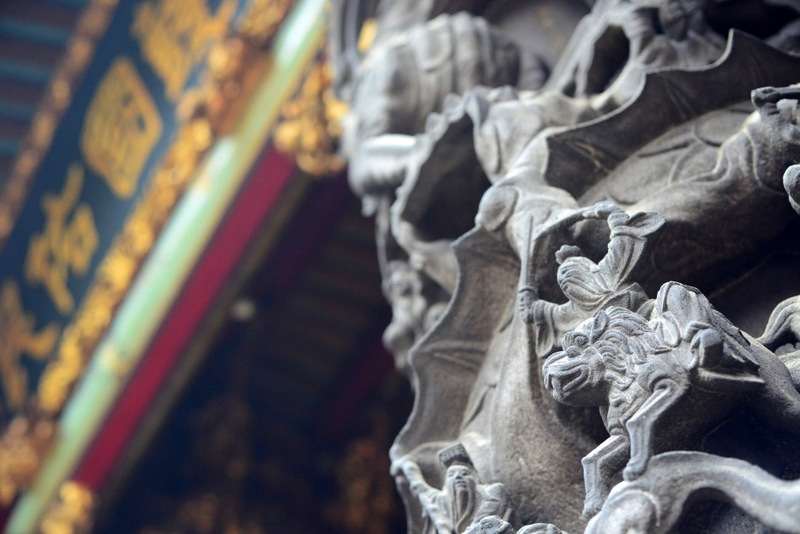 Splendid carvings decorate the exterior columns of the Main Hall. A number of smaller side halls dedicate to different deities lined up the perimeter of the temple complex. Alters and offerings in one of the smaller temple halls. 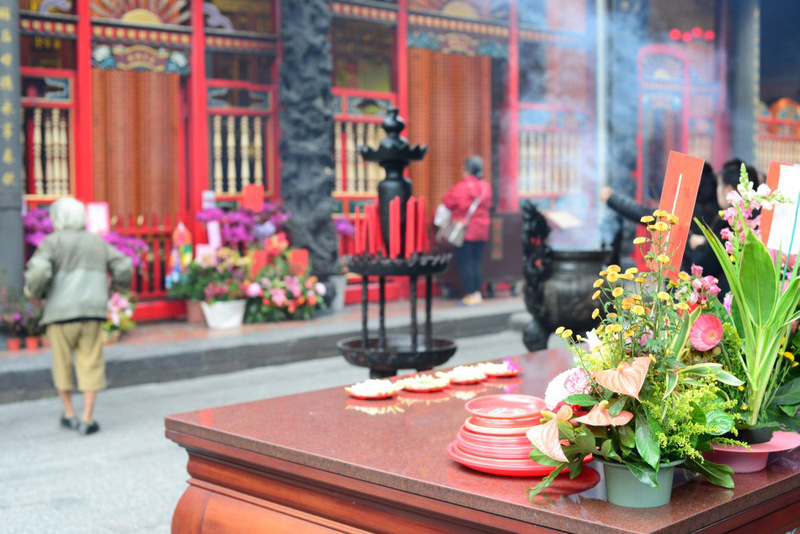 Incenses, candles, food and flower offerings could be seen on tables set up all over the courtyards in the temple complex. 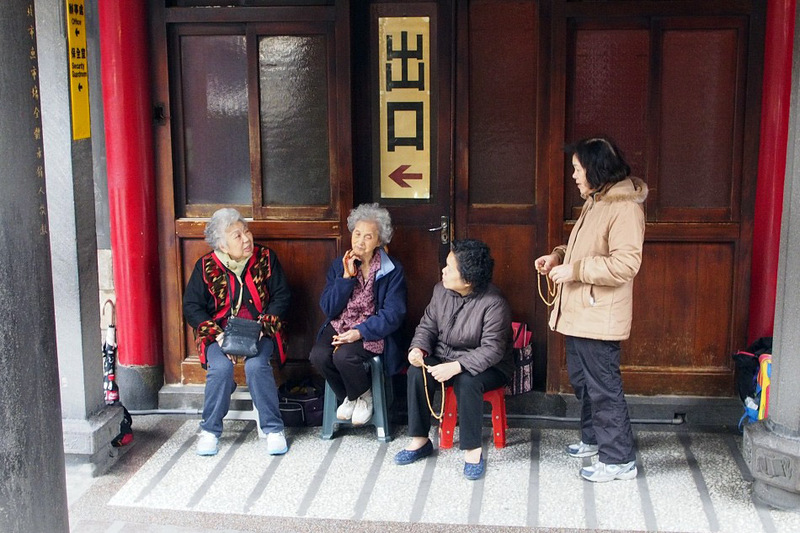 Groups of elderly gathered around the main courtyard socializing. 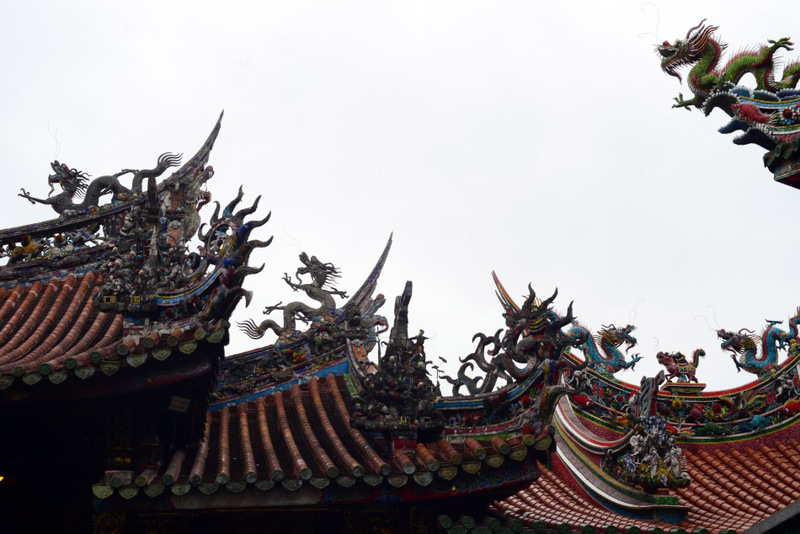 One of the most fascinating features of Longshan Temple is the dragon carvings on the roof ridges. Worshipers gathered in the main courtyard to participate a chanting ritual. No visitor comes to Taipei will leave without a visit to one of the city’s famous street markets. 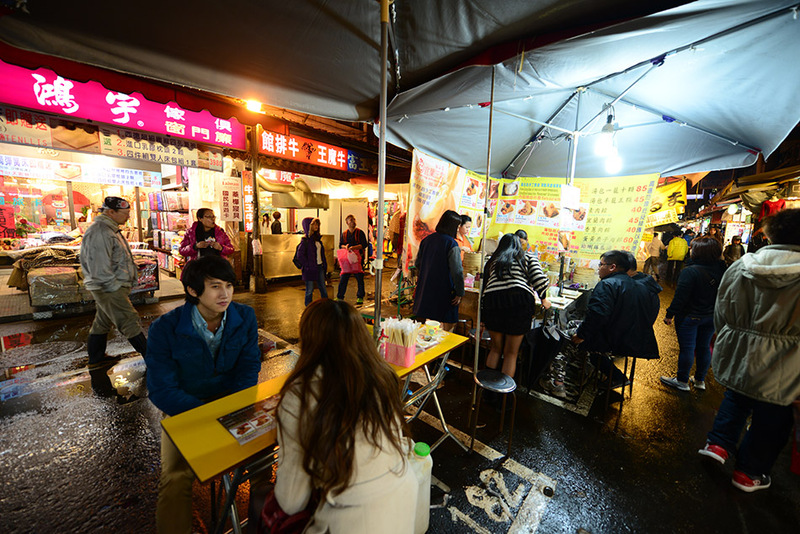 We picked Raohe Street Night Market (饒河街觀光夜市) at Songshan District. 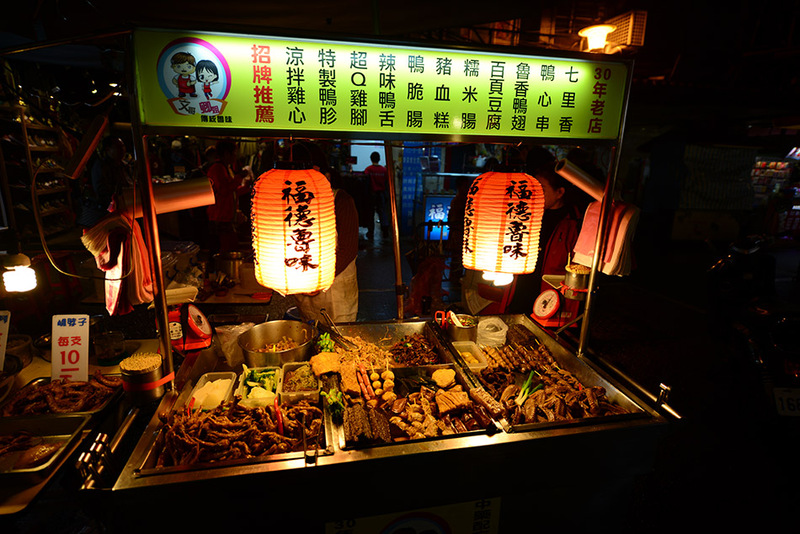 It was not only the wide varieties of food that excited us, but watching how each vendor earnestly prepared the food was also a fascinating experience. 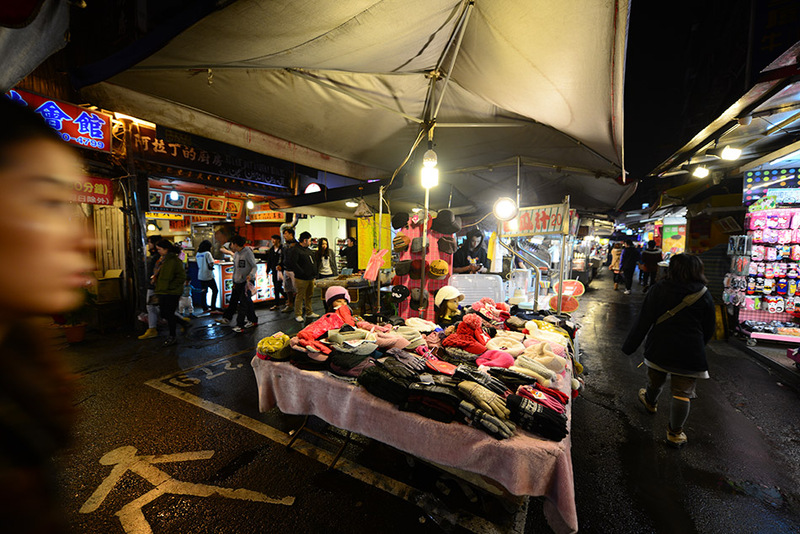 We entered Raohe Street Night Market through its east gate. 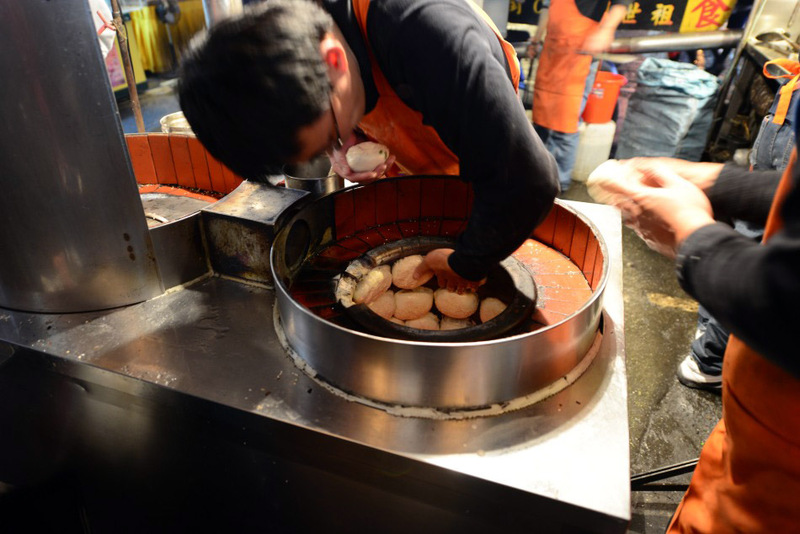 The famous black pepper buns were prepared with a traditional baking method in a cylindrical charcoal stove. 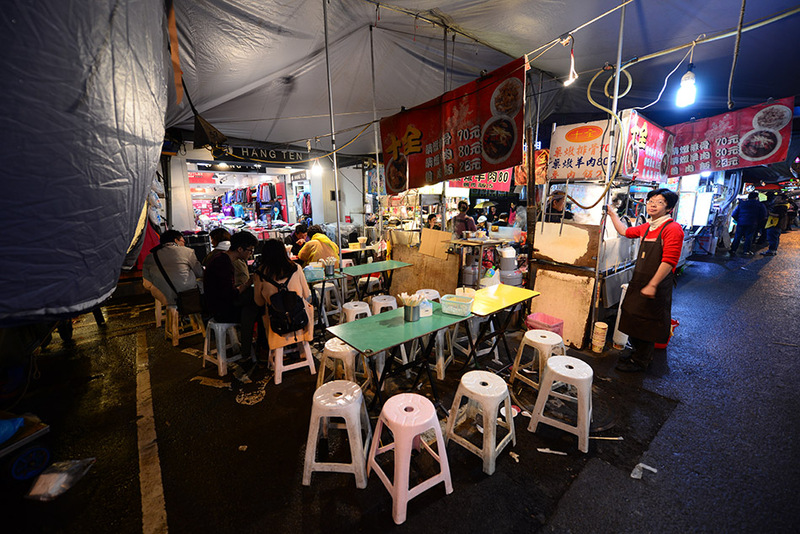 Some stalls were neatly decorated with colourful lights. 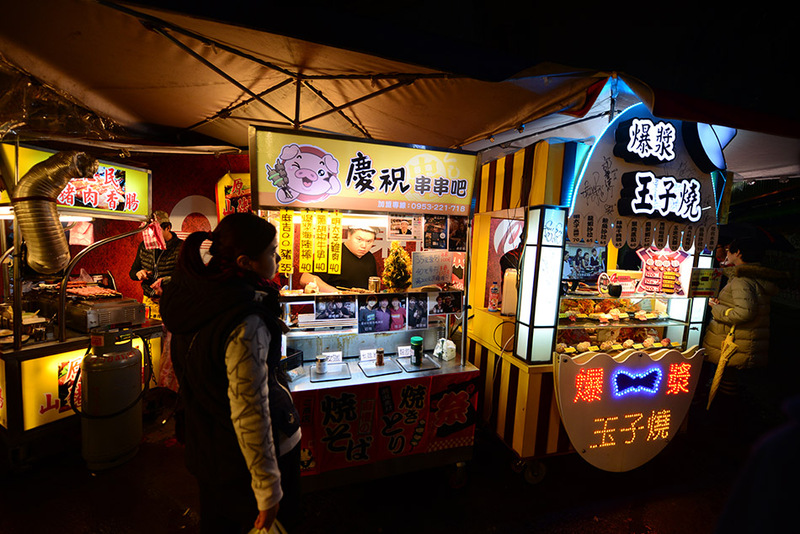 Several stalls were selling sausages prepared in indigenous Taiwanese style. Rice with mutton and pork spare ribs are some of the more filling options around. Tables were set up in the middle of the street. 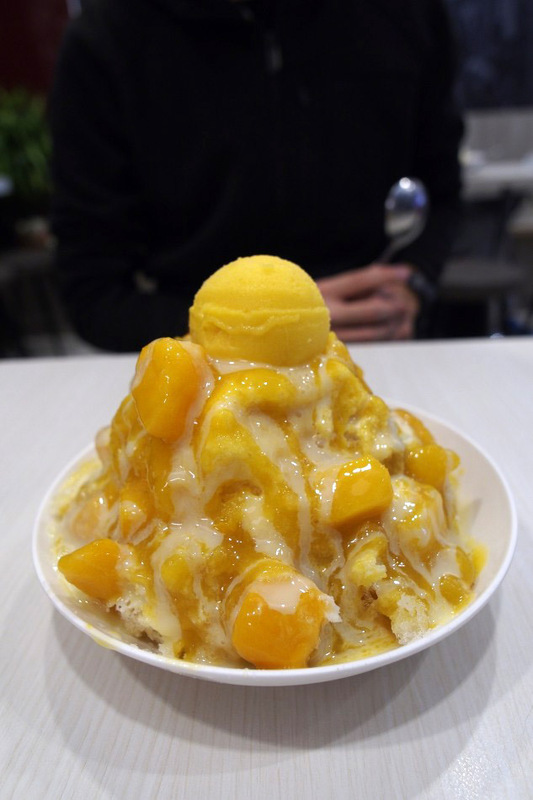 Mango dessert is a local favorite. 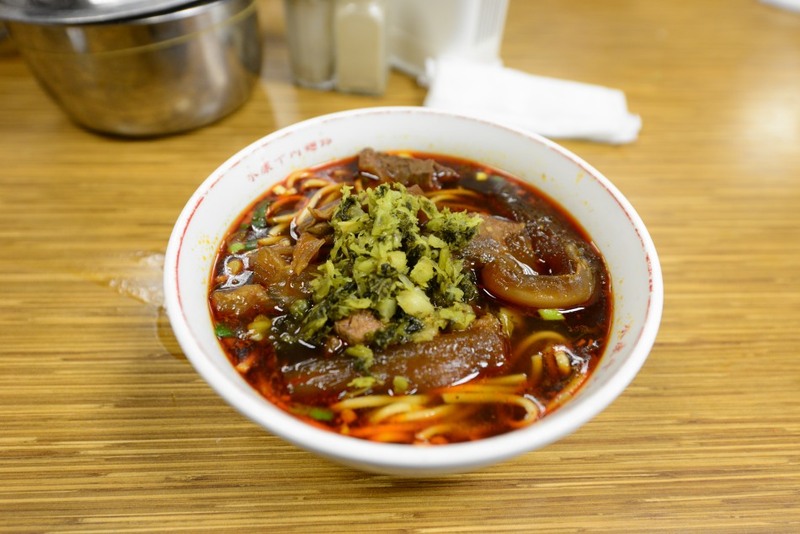 Spicy beef noodles, dumblings, and fish ball soup. 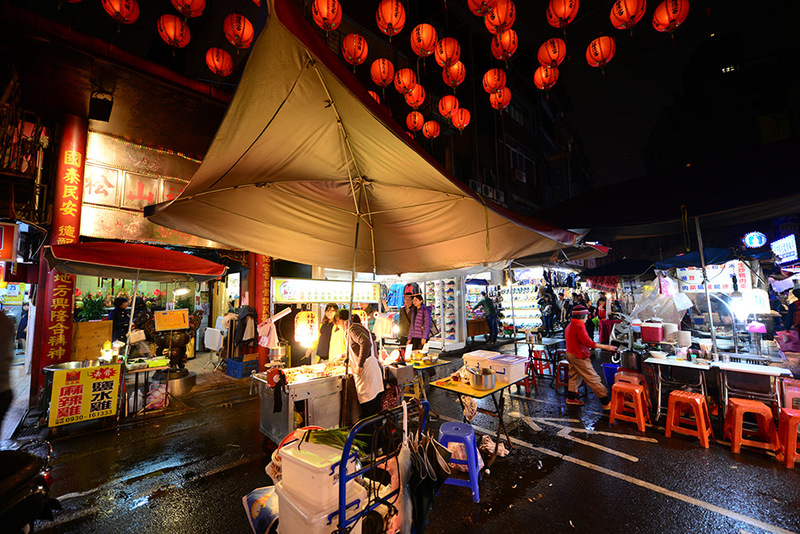 Red lanterns enhanced the atmosphere of the market. 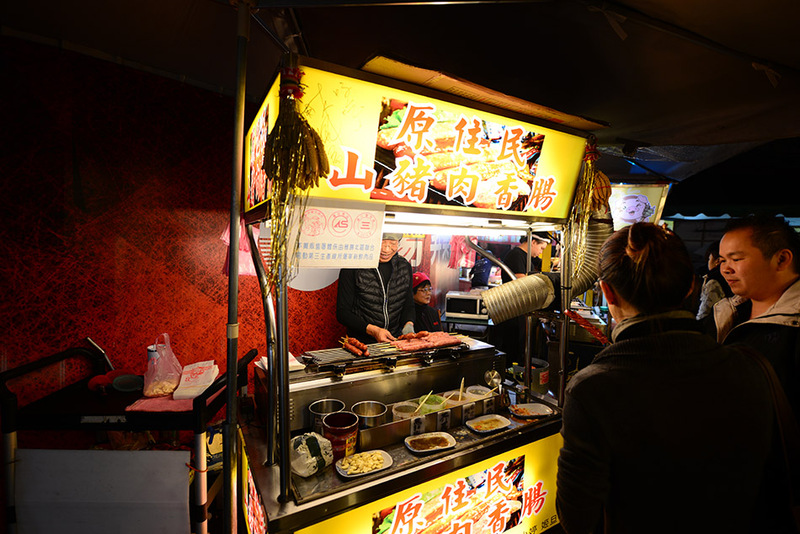 Meat and vegetable wraps were carefully prepared by this vendor. Dry goods were also sold in the market. 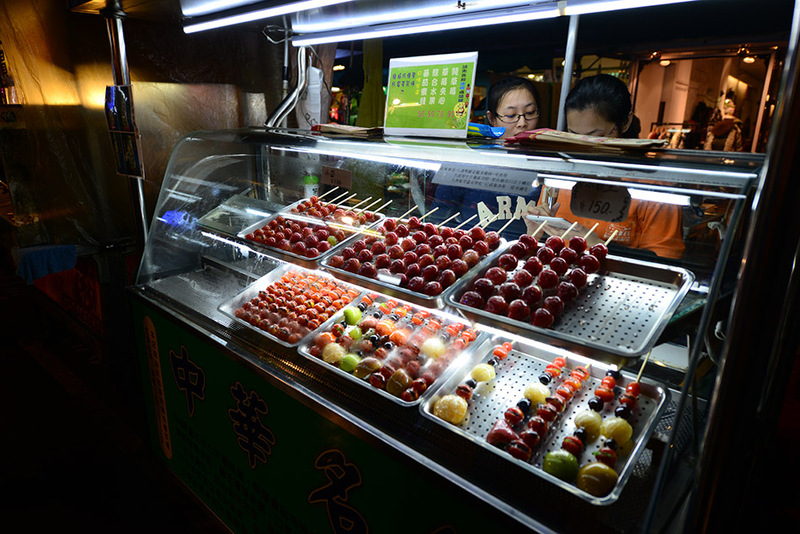 Ciyou Temple at the entrance of Raohe Street Night Market. 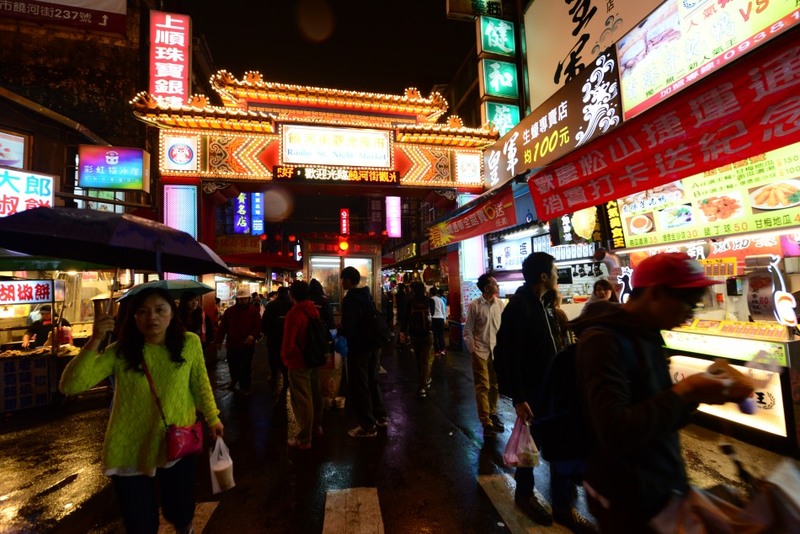 During Christmas, we made a brief visit to Taipei (台北), the capital city of Taiwan. 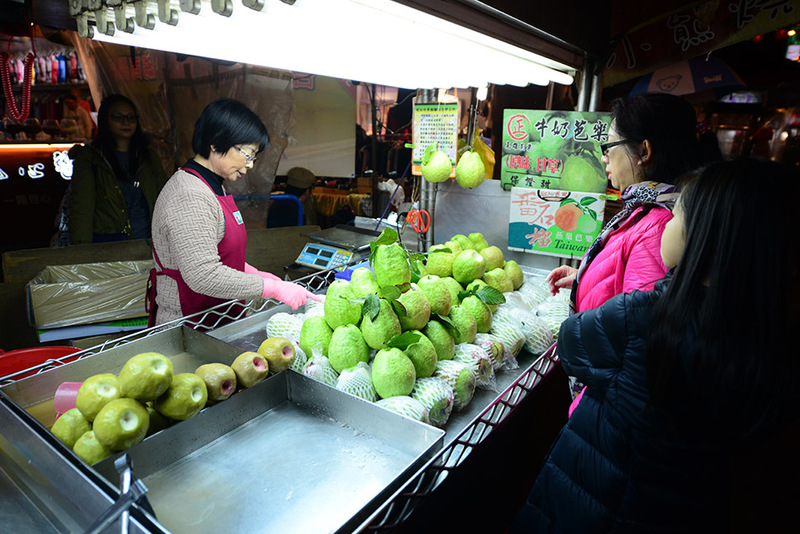 On Christmas Eve, we purchased a last minute flight ticket and hopped onto a last minute red-eye flight to Taipei for a two-day visit. 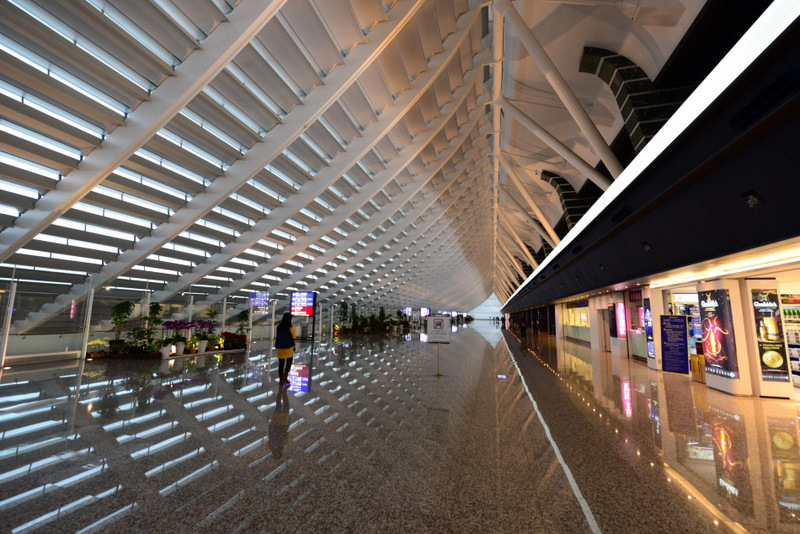 07:15 Christmas Day – We arrived at Taipei’s Taoyuan Airport. 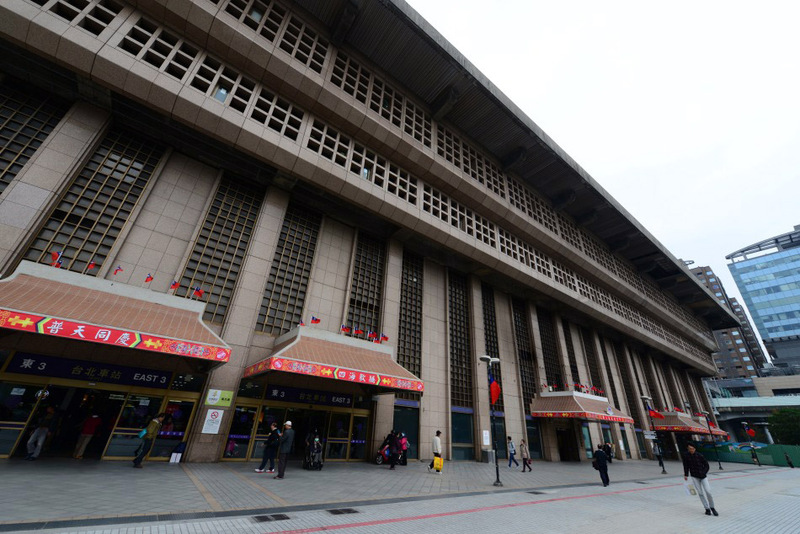 08:45 – The airport shuttle bus took us to the Taipei Railway Station at the heart of the city. 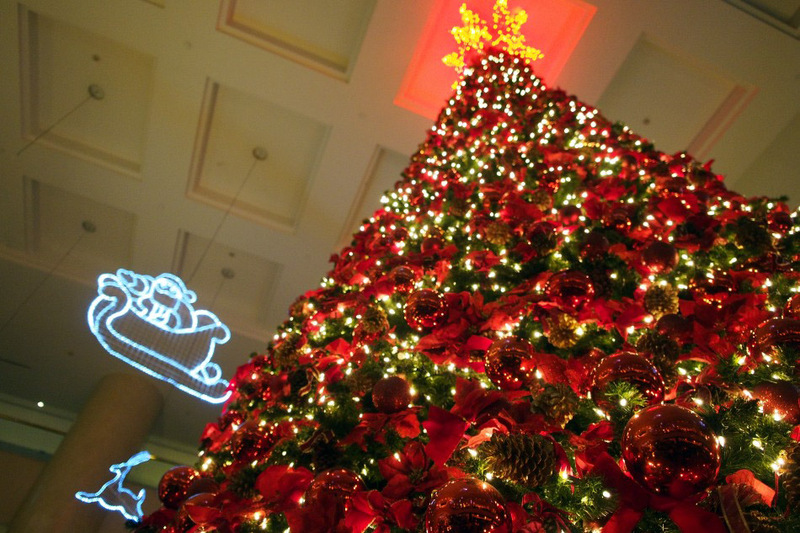 A huge Christmas tree was in display in the main hall. 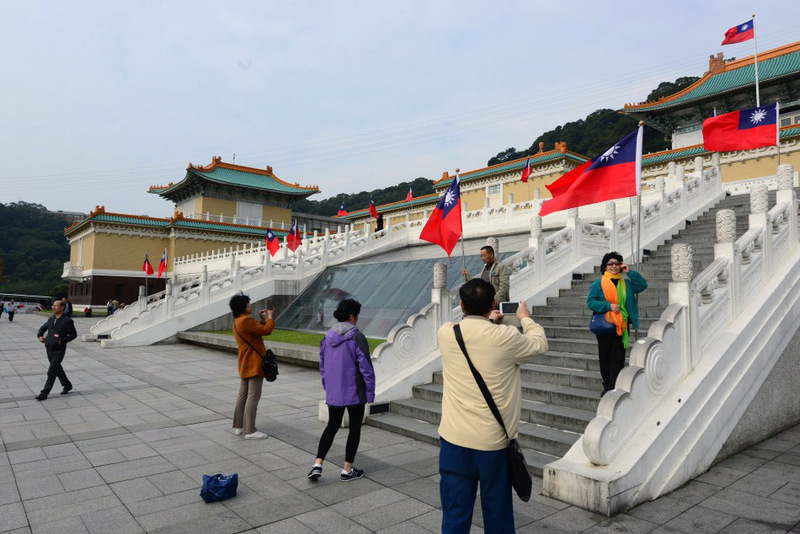 10:30 – We arrived at the National Palace Museum at the city’s outskirt. Its tremendous collection of Chinese artifacts and artworks is probably peerless in the world, with a majority of the pieces gathered from Beijing’s Forbidden City in the first half of the 20th century. We particularly enjoyed the Chinese paintings. The rotating display of the permanent painting collection currently on show is the works by Qiu Ying, one of the Four Masters of the Ming Dynasty. 14:45 – We returned by bus to Shilin, the closest metro station from the National Palace Museum. Adjacent to the station stood many small eateries. 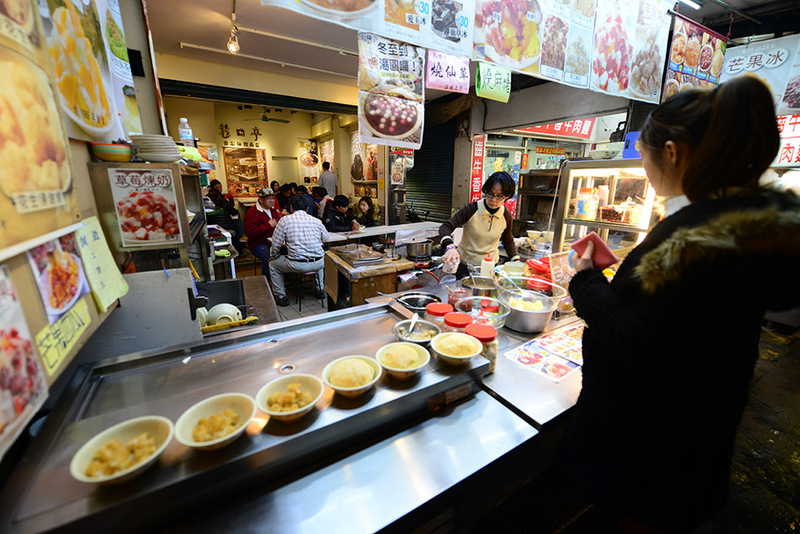 We picked one and had our first delicious meal of Taiwanese beef noodles and fish ball soup. 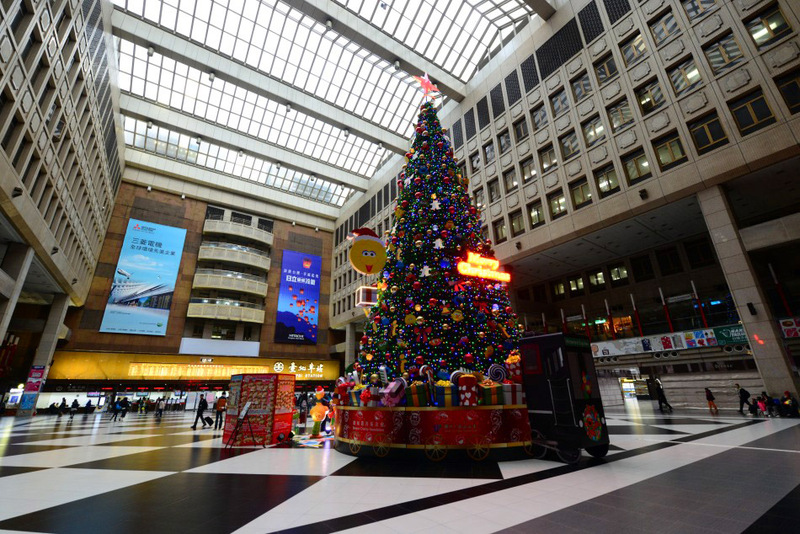 18:00 – We passed by an enormous Christmas Tree in a hotel lobby at Downtown Taipei. 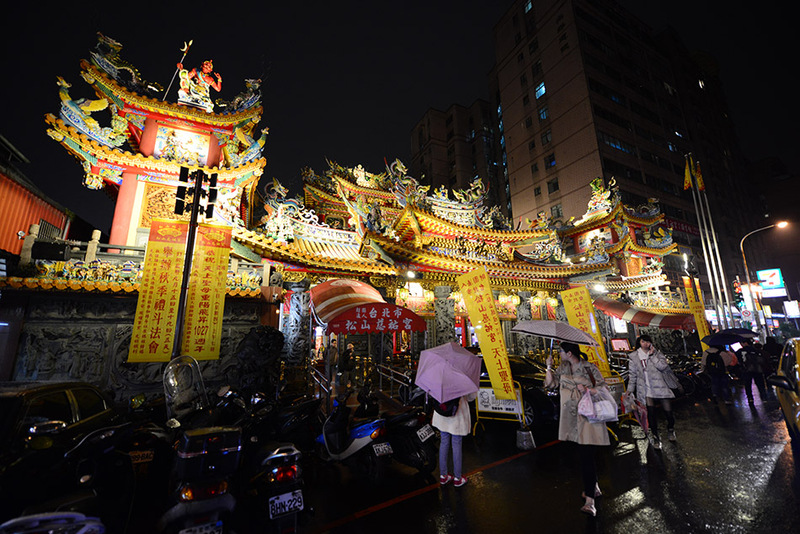 Despite Taiwan is not a Christian country, many hotel and restaurant owners decorate their stores to enhance the festive atmosphere of the city. 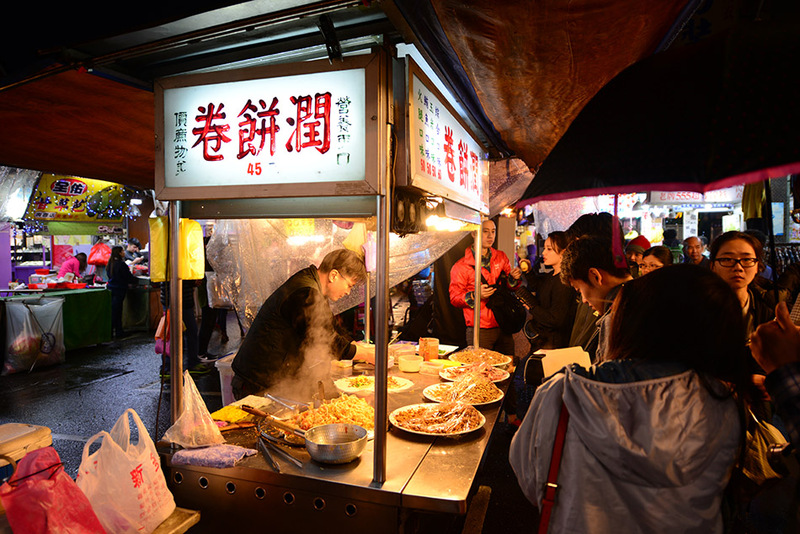 20:30 – We began our foodie stroll at Raohe Street, one of the most popular night markets in Taipei. 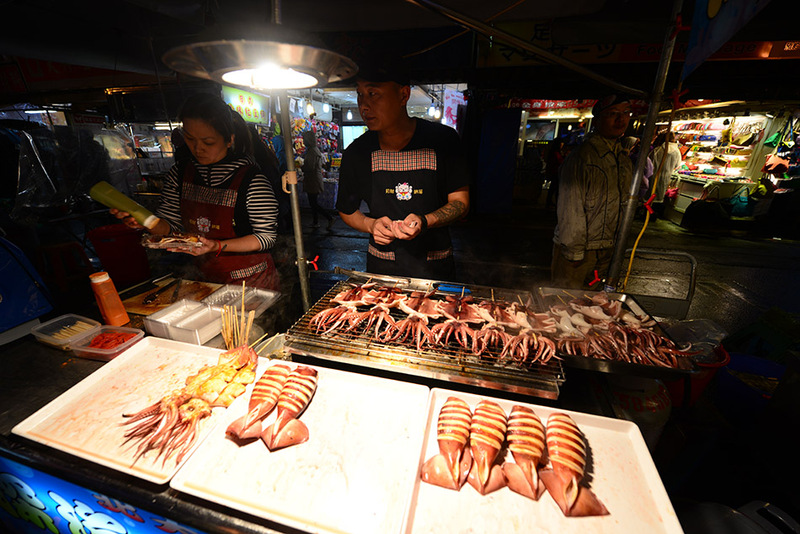 We hopped from one stall to another, and sampled a number of delicious street food including charcoal oven baked black pepper buns, grilled squid, grilled scallops, seafood soup, salted black-skinned peanuts and tofu dessert. 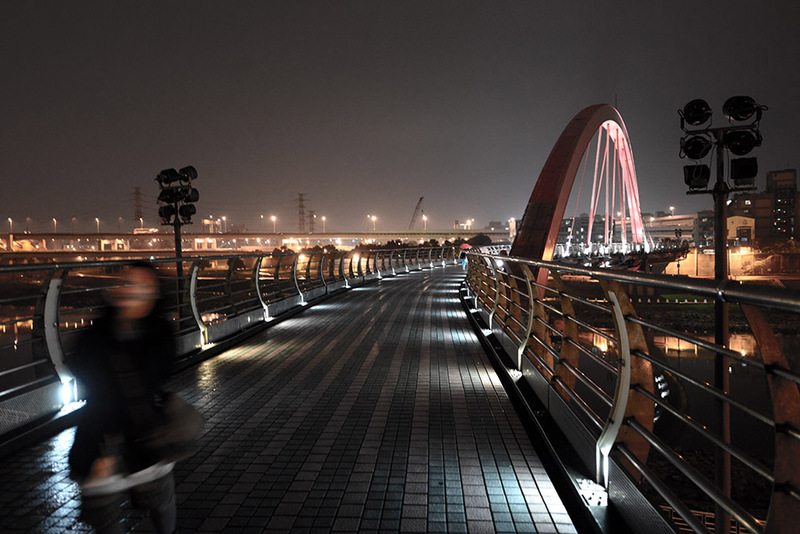 22:15 – After our visit to Raohe Street Night Market, we walked along the Keelung River. We stopped at the Rainbow Bridge for a while before calling it a day. 8:50 Boxing Day – We were on our way to Fuhang Soy Drink for breakfast and passed by Taipei’s largest Buddhist temple, Shandao Temple. It was built during the period under Japanese rule. 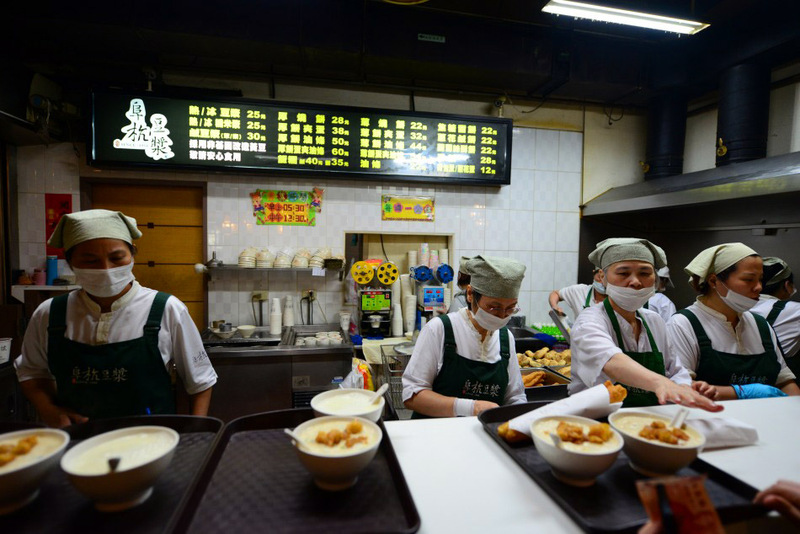 9:45 – After 45 minutes of queuing on the street, we finally made it to the counter of Fuhang Soy Drink. 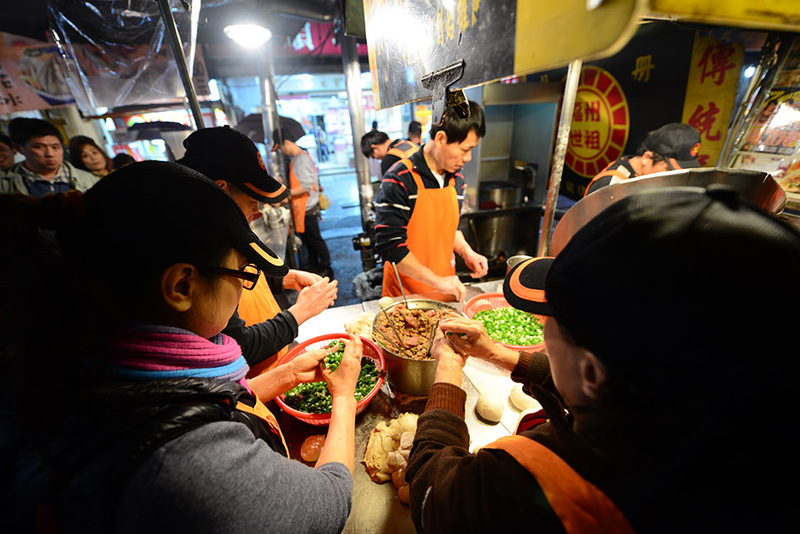 This busy eatery is located in a foodcourt, on the second level of a local market. Apparently it is very popular among the locals and tourists. 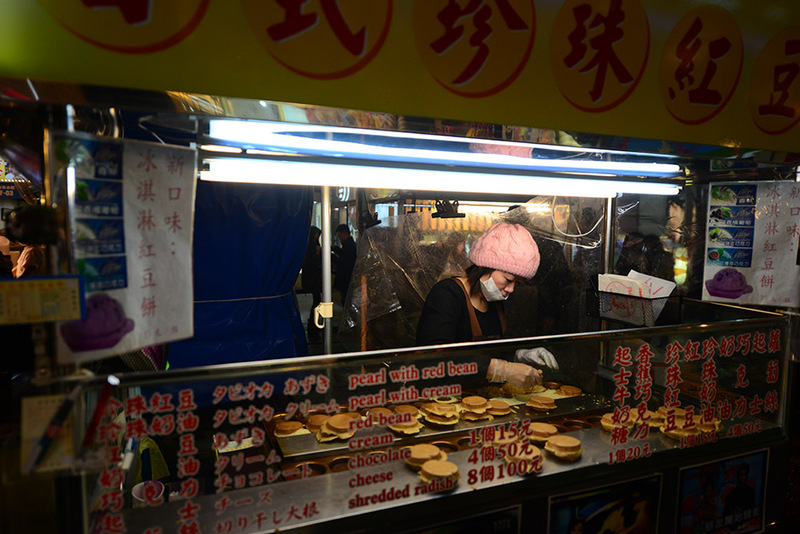 We had two kinds of pancakes with egg and Chinese fried dough, a sticky rice bun, and two bowls of hot soy drinks, one sweet and one salty. 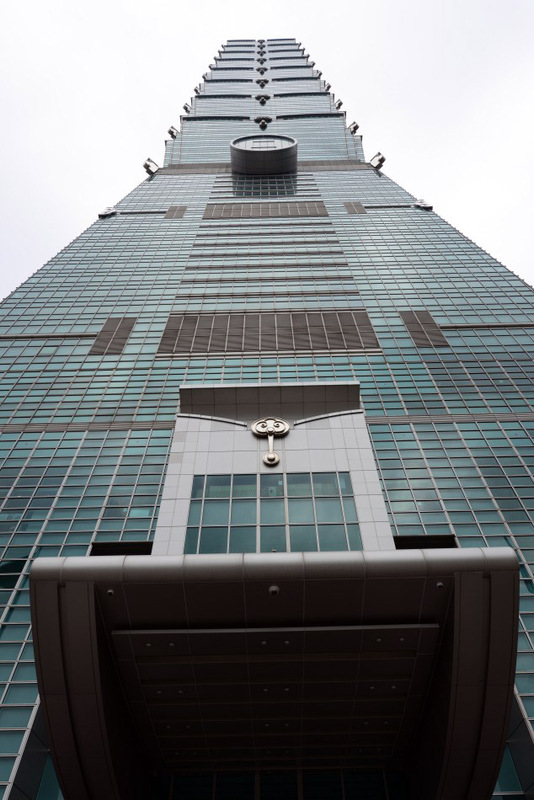 12:00 Taipei 101 (completed in 2004) is the tallest building in Taiwan. This skyscraper was awarded the LEED Platinum certification and designed to withstand earthquake and fierce wind. An observatory deck on the 89th floor is open for tourists but we chose to give it a pass because of poor weather. 13:00 We tried our first slush ice, one of the most popular dessert in Taipei. 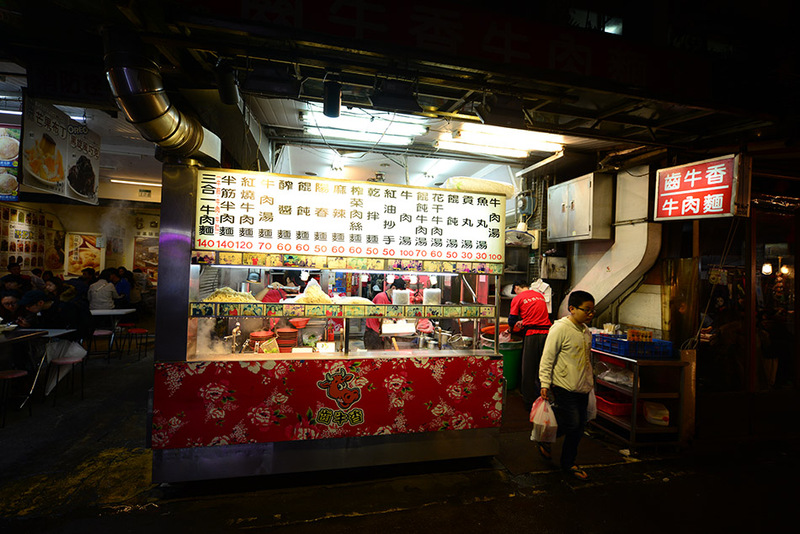 13:45 A good friend of ours recommended us to try the beef noodle from Yong-Kang Beef Noodle. 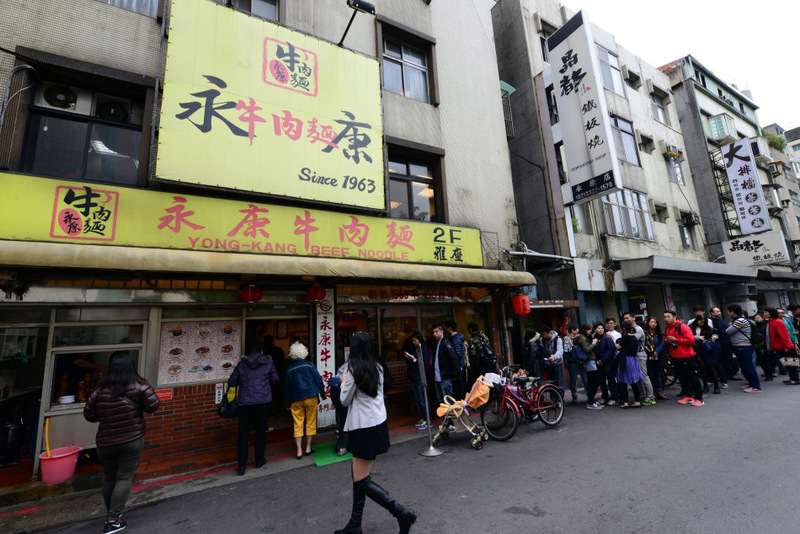 The queue was long but we didn’t want to miss the opportunity to taste one of the best beef noodle in Taipei. 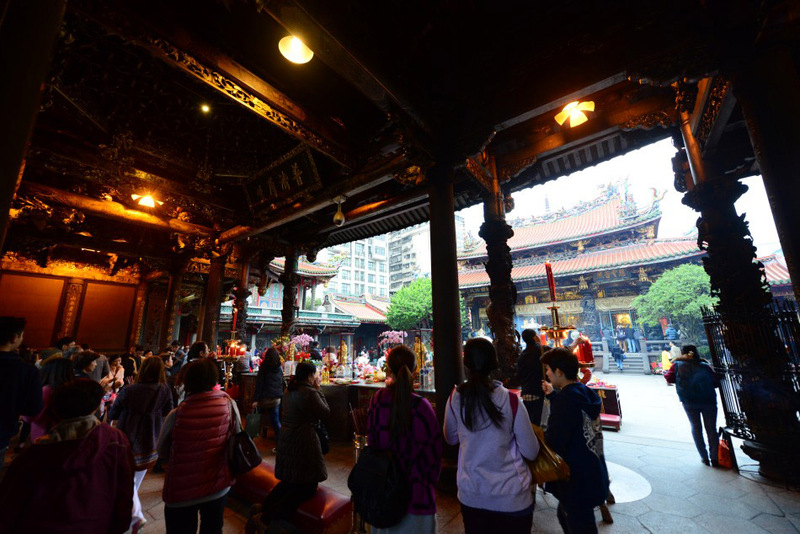 15:00 We decided to visit one of Taipei’s temples and we chose Longshan Temple in Wanhua District. 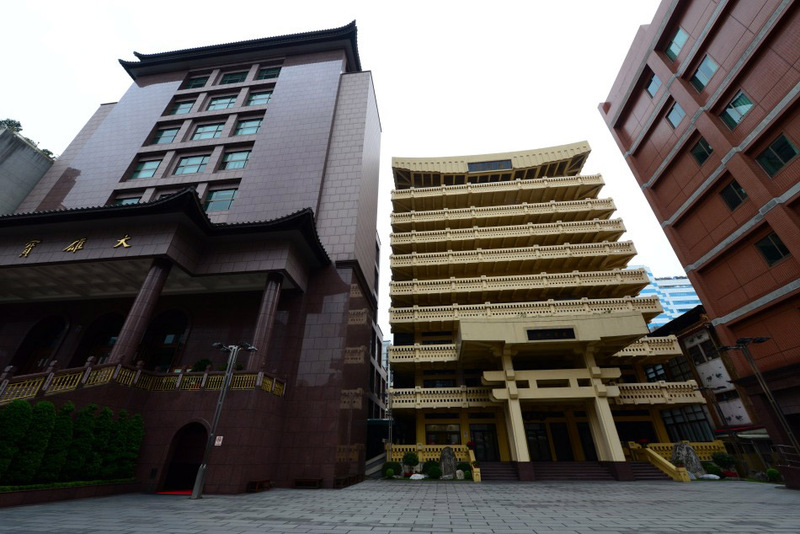 Longshan is the oldest temple in Taipei. 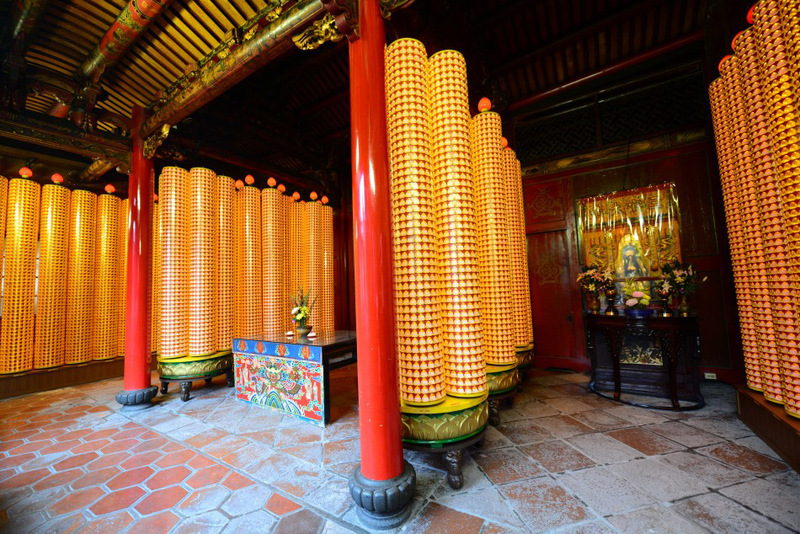 The temple is dedicated to a number of deities including Buddhist, Taoist and some historical Chinese figures. 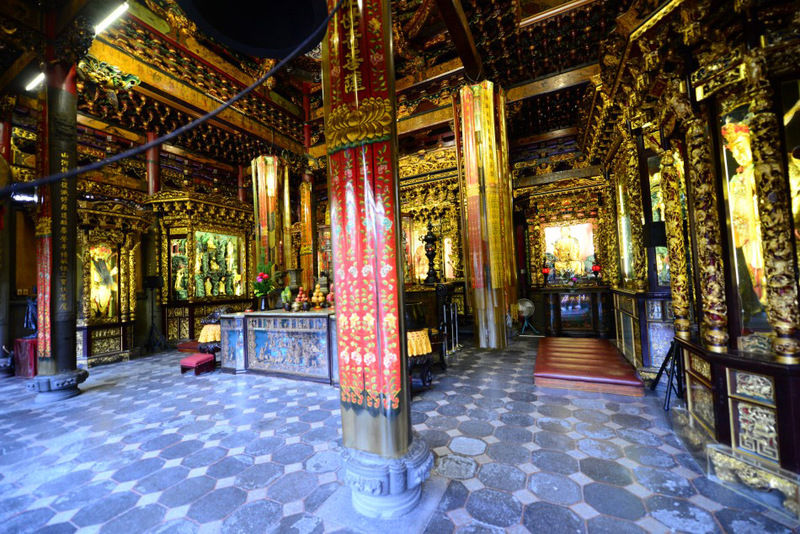 This lively temple is exquisitely decorated in a Fujian style. 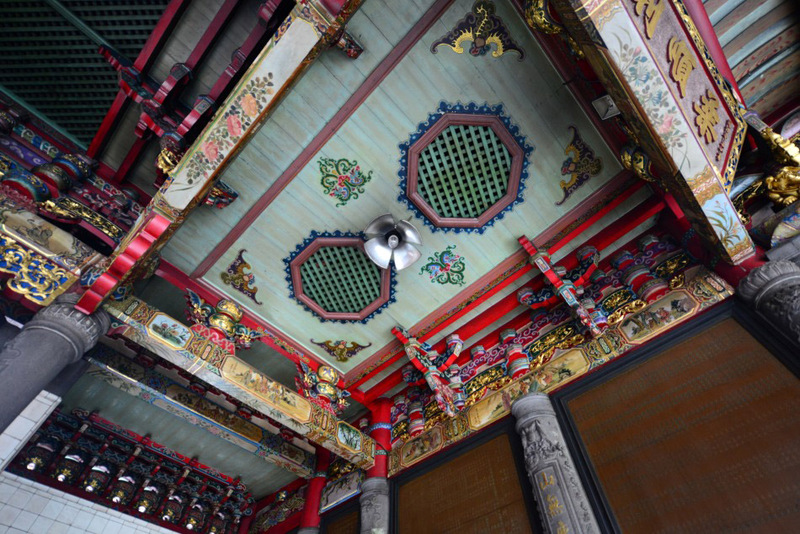 The dragon columns and eaves are particularly wonderful. 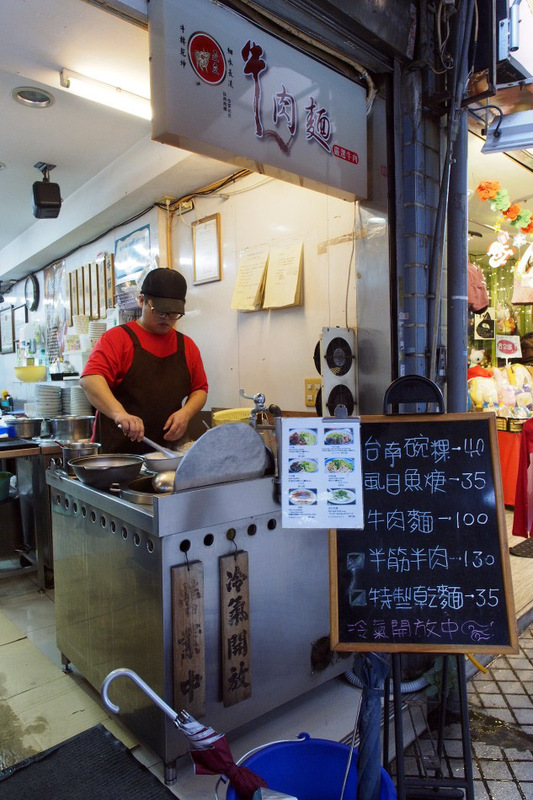 18:00 Before heading out to the airport, we spent the remaining day in Songshan District. This quiet area has many little local cafes and eateries. 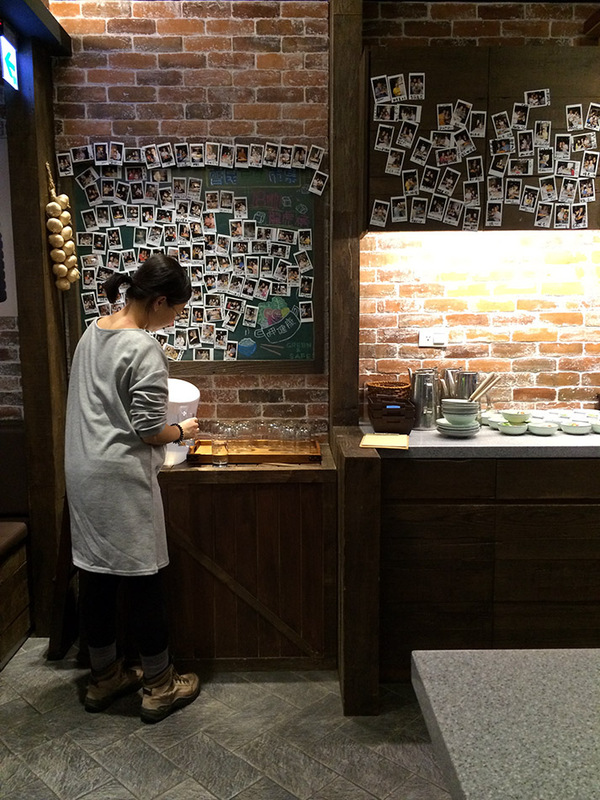 We stopped by a hotpot restaurant for a quick supper.